1) Preheat oven to 350 degrees. Line a 13x9x2 baking pan with parchment paper and spray the paper with cooking spray. Set aside. 2) Melt the butter, baker's chocolate and 1 cup of chocolate chips in a double boiler. Allow to cool for about 20 minutes. 3) In a large bowl, mix the eggs, coffee granules, vanilla extract and 1 cup of the sugar together. Sift 1/2 cup of flour, baking powder and salt together over the egg mixture and stir. 4) In a small bowl, mix 3/4 cup of chocolate chips with 2 tablespoons of flour. This will keep the chocolate chips from sinking to the bottom of the pan as the brownies bake. 5) Once the melted chocolate mixture is cooled all the way, add it to the egg mixture and stir. Then, add in the chocolate chip-flour mixture and stir. 6) Pour the batter into the prepared pan and spread it out evenly. Bake for about 30-35 minutes or until a toothpick comes out clean. 7) Right after the brownies come out of the oven, heat the caramel sauce in the microwave. Remember to remove the lid first! 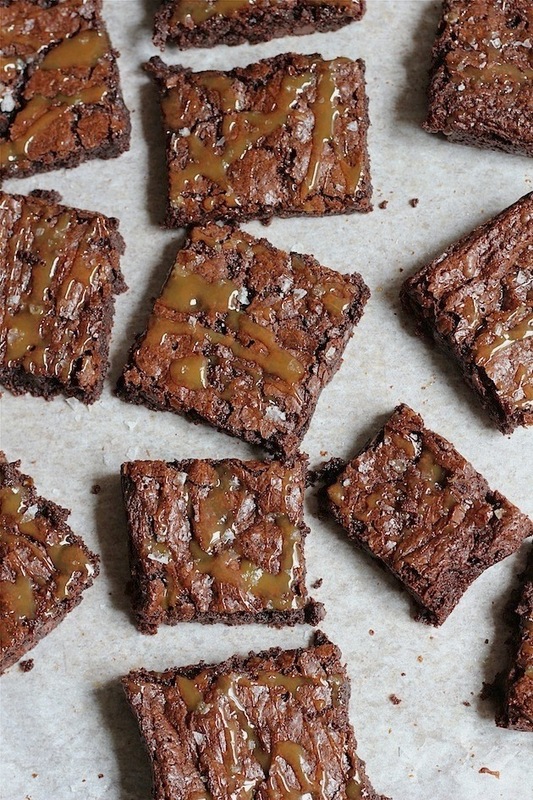 Drizzle the sauce over the warm brownies, then sprinkle with the sea salt. 8) Let the brownies cool completely before cutting into squares. Enjoy!! i too am not a fan...but man oh man do these look incredible! I want these for breakfast. Ya-hum. These look delicious, and I love caramel so yum! Ahhhhhh my mouth is crazy watering!!!! My favourite ingredient used with chocolate used to be raspberries but it's definitely caramel and sea salt!!!!! ooh yummo....but i wonder if this would work with espresso rather than coffee granules?? I'm sure you could! I would add less since espresso is stronger than regular coffee. This is CRUEL!!!!!!!! I love chocolate and caramel so needless to say these would never ever make it to anyone else's plate...I would gobble them up. YUM!